Flashscan's fingerprinting uses stripes of light to capture a 3D image with no touching. During America’s long love affair of watching cop shows (from Hawaii Five-O to CSI) the fingerprint has been a staple. As soon as someone said “book ’em, Danno” out came the ink, the little pieces of paper and the rather genteel pressing and rolling. Modern shows will often reference the FBI’s AFIS (Automatic Fingerprint Identification System) with elaborate light shows and quick flashes of mug shots as the computer desperately searches for a match to a fingerprint. Yet, for all the glory it gets, the fingerprint has evolved very little in the last 60 years. They’re still two dimensional. The US department of Homeland Security and the National Institute of Justice are hoping to change that. They’ve given grants to dozens of companies to perfect touchless 3D fingerprinting. Two universities (University of Kentucky and Carnegie Mellon) and their two respective start up companies (Flashscan 3D and TBS Holdings) have succeeded. 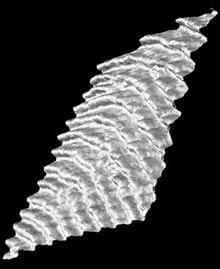 Fingerprints have reached the third dimension and they are faster, more accurate, and touchless. Biosensors are the future of security checks. We’ve already shown you how they include face and gait analysis and are reaching towards brain scans. One day you might even use your ear to prove your identification. In the meantime, however, fingerprints have the history, and the online databases to serve as the premier form of security ID. 3D touchless fingerprinting will allow rapid processing of people in public places (each finger scan takes less than 1 second) and most devices function automatically. When technology gets quick and easy to use, it starts to become much more common. We could see 3D fingerprinting become as ubiquitous as metal detectors. Despite the iconic TV imagery of ink and rolling fingers, most modern fingerprinting is done with digital scanners. Fingers are pressed against a plate of glass and the print is recorded. The image taken is two dimensional, distorted by pressure, and can be confused by sweat and oil left on the glass. It typically takes several minutes to process all ten fingers. Flashscan's technology produces a 3D map of the fingerprint like this one. 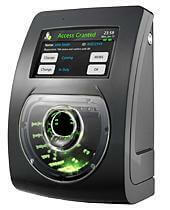 The 3D fingerprinting from the University of Kentucky and Flashscan 3D, however, takes just 1 second per finger. Because there is no contact between the scanner and the finger, there is no danger of distortion or interference from oils and sweat. 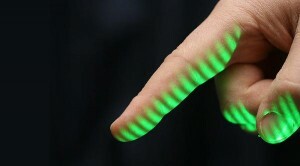 The scanner shines a series of striped lines of light on the finger (called structured light illumination, SLI) to highlight the depth of the contours of the print and obtain a 3D image. SLI, coupled with a 1.4 megapixel camera, gives the Flashcan system a resolution of about 1000 pixels per square inch. That’s twice the requirement for AFIS. To integrate with that database, Flashscan has special software to flatten the 3D print into 2D without cracks or stretches. Yongchang Wang, one of the leaders of the project there, hopes to get the scan time down to 0.1 second and to be able to scan all ten fingers at once. Flashscan 3D doesn’t have a fieldable product yet, but was able to use its prototype to compare its 3D fingerprinting to traditional 2D scanners. On a scale of 1 to 5 (with 1 being best) the Flashscan scored 1.1519, beating a traditional device at 1.7125. Not bad. Of course, Wang and the Flashscan team have some serious competition from Carnegie Mellon and TBS Holdings. TBS already has both a single and 10-finger scanner (actually, it does 4 fingers at a time, and then both thumbs) and has slated serial production of their devices for 2010. The accuracy, speed, and flattening software (3D to 2D) for both companies are similar. Right now, the vast majority of the 47 million people in AFIS have a criminal record, and fingerprinting is associated with crime. Soon, however, fingerprinting could become simply another way of proving who you are. Walking into an airport, or often even a bar, you have to show ID cards to gain access. With rapid 3D fingerprinting, we may be leaving cards at home and just showing our hands. Security checks at ballparks, schools, or hospitals could easily incorporate the new kind of scanning without markedly slowing down access. That opens the technology to privacy concerns. What kind of information should be attached to your fingerprint? Who should have access to fingerprint databases? As privacy evolves in the 21st century, we may be less concerned with recording the identities of criminals and more concerned with making sure our identities aren’t criminalized.